From left to right: Michelle, Bethanna, Rebekah, Jordan, William, and Sam. ANCHORAGE, Alaska - March 8, 2019 - PRLog -- In the past quarter, Beacon Media and Marketing has undergone exciting growth and change. 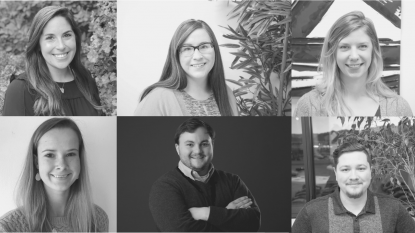 After expanding to open a strategic, second location in Reno, Nevada, the powerhouse digital agency hired four new staff members and promoted two of their current employees to better serve a growing client base. The new talent takes on roles of account management, art direction, and content creation. William Walsh joins the Beacon team as an Account Manager, previously serving as a Marketing and Public Relations Manager for an Alaska regional air carrier. Walsh's knowledge and experience in Alaska communications and public relations make him a perfect fit for the agency's local clients. "I am excited to have the opportunity to join the Beacon team." He says, "I am looking forward to forming strategic partnerships and contributing to the growth of our clients." Formerly an Account Coordinator at Beacon, Michelle Williams has been promoted to Account Manager. Williams will be serving the agency's national clients as the agency continues to grow and expand. "I am so excited to be taking on the role of Account Manager!" She says, "I am also thrilled to connect my previous professional experience as an Account Manager in the medical industry with Beacon's goal of reaching health and wellness clients. I love being a part of making our client's experience with Beacon a great one!" Bethanna Bennett comes onboard as the new Art Director for Beacon. With a background of over 20 years in the Alaska design industry, Bennett will be guiding the agency's clients through their branding, graphic design, and website design projects. "After years of watching all the amazing creative work Beacon has produced, I am thrilled to be able to join the team. I am passionate about supporting locally owned and operated businesses in Alaska." She says, "I look forward to helping clients form their own, unique visual identity and watching them grow their business!" Previously Writer, Editor, and Web Project Manager for Beacon, Jordan Inks has been promoted to Content Manager. In her new role, Inks will be implementing content marketing strategies for the agency's clients. "Words cannot express how excited I am to show our clients what content marketing can do for their business!" She says, "I was taught content marketing theory in school where I learned just how successful strategic blogging can be. In the first few months of launching these strategies for our agency, we have already seen outstanding results (first page of Google for targeted searches)!" Rebekah Little joins the Beacon team as a Content Creator. She was formerly the social media marketer for her college's career development office. In her role at the agency, Little will be producing creative content and graphics to meet client social media goals. "At Beacon, I enjoy the opportunity to pursue my passion for marketing as a content creator in a creative atmosphere!" Sam Brest is the agency's new Marketing Assistant. Brest assists the marketing team at Beacon on any projects that need additional resources, with a focus on photography and Google advertising. "The best way to describe my feelings toward the Beacon team is grateful. I have been welcomed every step of the way and have already learned many new skills to broaden my horizons. My hope is that in the future, as the digital marketing industry evolves, I continue to evolve with it here at our agency." Beacon Media and Marketing is an Alaska-based digital marketing agency with a national impact. The agency has a proven track record of success, harnessing the power of data and award-winning creative to deliver outstanding results for their clients. Their services include everything from social media marketing to corporate branding to website design. Beacon recently expanded to Reno, Nevada to better serve their clients from coast-to-coast and to tap into the emerging market and booming tech hub that Reno is becoming. Visit Beacon online at their newly redesigned website, beaconmm.com!